My speical puppy can practically do everything right! Shes 5 months now and can sit, stay, heel all the rest of that nonsense... but when it comes to walking... *UGH* we just cant seem to get it right! The trainer at puppy school suggested I get her on a choke-chain for walking, which I was using for about 2 months, but she still pulls like crazy - lunges and generally misbehaves on her walks. Yesterday when i was grooming her i decided to take her collar off and give her a real good brush near her face (she doesnt like me brushing under her mouth) and i saw that her neck was all bruised from the choke chain. I almost CRIED! What can i do to make her stop lunging like a retard when we walk? I've tried EVERYTHING! Its hurting her and its killing me to see my doggie bruised. We walk twice a day, and before letting her out of the house, she needs to sit and wait until i'm out the door and i give her the signal to come. She's very calm when we leave - but she over excites herself so much on her walkies... heavens above if someone stops to pet her. Game over for me! She just WILL NOT calm down. Please help me. I'm at my wits end! Seriously! For a dog who can heel perfectly, the second you take that first step she just lunges forward. Can't really help you, I'm afraid, Loo also has the sleddog gene. Try a nylon choke collar to do less damage to her skin. Try not to let too much time pass between walks. The more evenly her walks are spread, the less excited she gets. Does she calm down the longer her walk lasts? Then make sure she gets enough exercise. How long are the walks you are taking her on? They may be too short! I would at least try a harness though. Maybe it works for you, who knows! I've heard the more resistance a dog encounters, the harder it pulls. That has not been true for Loo, but maybe it will be true for your dog. I most definately understand MissV what your are describing..... Matilda is 7 months old and within the last couple of months she has started pulling, pulling, pulling. She had no desire to pull before this. I suppose it's an adolescence thing. I walk her everyday for about 30-45 minutes and she absolutely loves to go for walks. Me not so much right know because she pulls soooo hard. Another thing is she loves everybody and she expects everybody to love her. If we are out on a walk and she sees someone she thinks they automatically want to visit with her. Not the case all the time. This is sometimes what starts the pullilng. I think I am going to try the Easy Walk harness and see if that helps at all. She really is kind of nosey when I think about it. She has to see for herself what everyone and everything is doing. If anyone else has any suggestions how to at least slow down the pulling I'm open to any and all ideas. 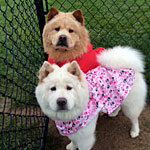 a: chows can't easily back out of it, a problem with standard collars. b: I find that the dogs seem to adopt to the harness quicker than a collar. c: I find it is less stressful for the dog, since the pull force is placed on the shoulders and chest. d: I find it gives you better control. You can get a lead that has a loop near the snap hook. If your dog wants to be stubborn, if you grab the short loop,you can actually pick up the dog. It is hard to pull if your feet are not on the ground. it is easy to keep the dog beside you in a heel position. I have a number of post discussing my preference for a harness, and I invite you to review them. Now my wife tried the no pull lead that has the loop which goes around the muzzle and puts some resistance to lifting the head and muzzle when they pull. She felt it gave her better control when Ursa was a few months old. I never used it, and always used the harness and a firm voice command to maintain control. Of course, every dog is different, but I would recommend you try a harness. 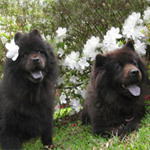 Yes, some chows will act like sled dogs but some dont. You should try the tips from Ursa's daddy and decide for yourself. 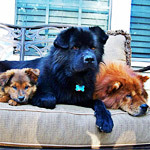 All my chow chows wear (have worn) harnesses. My Leo was so smart, at first I used a slip chain and he figured out that he could leave slack in the lead then back out of the collar took me an hour to catch him cause he would let me almost grab him then run just far enough that I couldnt reach him. Now that harness comes in handy when my little alpha girl decides shes gonna take on Chumley we just pick her up & move her (just the distraction she needs to behave). I've used harnesses, choke chains, prong collars, gentle leader head collars, and easy walk harnesses, too. 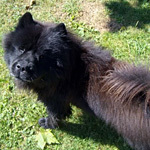 And quite honestly, the best thing that worked for my chow girl, Tippsy, was the Easy walk harness. However, with my mix boy, Jasper, the prong works better. And then, with my mix girl, Dixie, the gentle leader head collar works best. It's all about trial and error. What works for one, isn't always gonna work for another. I have a sled dog as well with Boogie. I have used the gentle leader with the halti on his face which worked well until he decided he had enough of it and threw himself on the ground and scraped his face until he got it off. So I switched to a no pull harness. I also use a regular collar with a leash attached as well. I control where he goes with the neck leash and control the pulling with the harness. When he is behaving, then I loosen up on the harness leash. I recommend two forms of restraint for any puller because I have had collars and leashes break and then you have a loose dog. Here is a link to the photos. Tychowgirl has posted photo of her dog wearing an "Easy Walk Harness", and then there is a discussion between Oceans and Tychowgirl about the harness. You might want to review this. I started using a harness on my chowkid, but not because he was pulling when we walked - it was because when his ruff was full his neck was bigger than his head, so a standard collar came right off! Yvonne, you are correct, that wonderful chow stubbornness and a few steps backward can allow our woolly buddies to slip out of a standard collar. Yvonne, that is exactly why I switched to a harness on Topaz (chow/corgi mix with an all-chow ruff). I also found that a retractable leash worked best with him to correct the pulling problem. I think it gave him a sense of freedom led to him not wanting to pull. Thanks everyone for the info and advice. Puppy school is going to be doing some walking exercises this weekend to re-train all the pups to walk so i'm really looking forward to that. I didnt find using treats to keep her heeling helpful at all! I didnt get a harness and i stopped using the choke chain (as said above). Our morning walk is only 15mins and our afternoon walk is about 30 - 40mins (depending on her). When she starts to rush ahead. I stop. I yell "STOP!" and she kinda gets it. Then i catch up to her taking a REALLLLY calm walk... as we start to walk again, i keep her leash VERY short holding the leash in my right hand, dog on the left. This control has helped me a lot. As she starts to pull, i pull back on her and say "walk nicely!" I can also control her direction from this point and stop her from sniffing everything along the way. I've been doing this for about 5 days now and i seem to be getting good results. SHe literally has no choice but to walk RIGHT next to me. I am starting to let the leash lose now and she stays at my side. If she wonders too far, then back we go to square one and start the process all over again. Annoying... but we're getting there! ps: Oceans - you and i must have doggies from the same litter because you have described my Slush to a Tee!!! !